I figure that if I get my monthly favorites posted within the first two weeks of the following month, they are not completely irrelevant yet. That’s my logic and I’m sticking to it. The last few months have been extra super busy for me because of my work schedule, and I am itching for life to settle down so that I can get back to posting regularly. I can almost see the light at the end of the tunnel, as I’ve been told my work schedule will go back to normal in a few week. Yay! I did manage to come up with some favorites for the month of February. And I thought the would look nice in a star formation. Lets start at 12:00 and go clockwise…. At noon we have Wet n Wild Fergie – Going Platinum. This polish, is amazing! 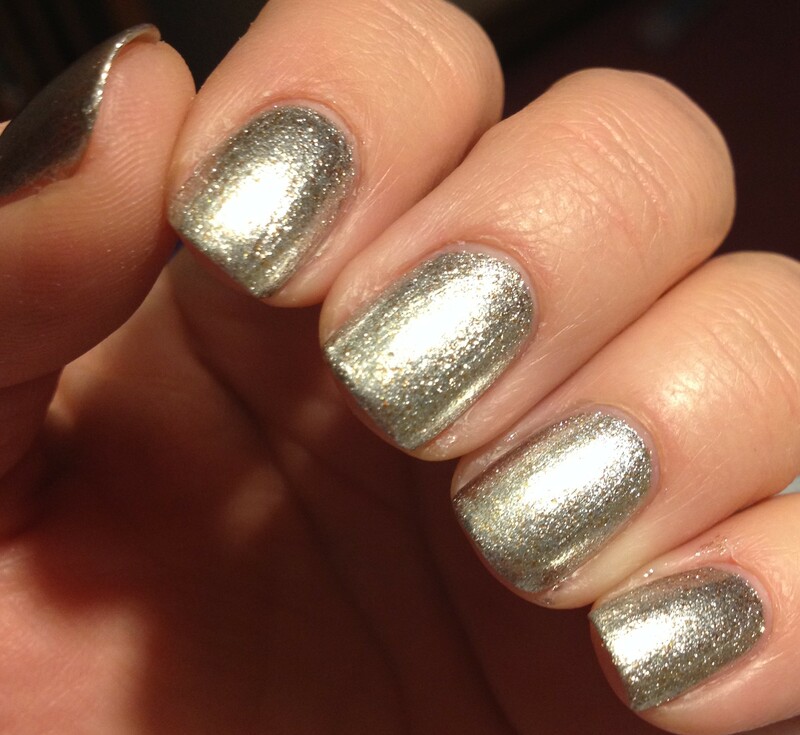 It’s a foil finish, so it has a little more sparkle that just a straight metallic polish. Also, metallic polishes tend to show brush strokes, but this doesn’t at all. It’s opaque in two easy coats. Really, this is just a great polish. All of the stuff I just said also goes for Wet n Wild Fergie – Gold Album. Gold album has the exact same formula and finish. It’s just gold instead of platinum. (That last sentence was probably unnecessary.) Plus, they are only $3 per bottle! I don’t love all of the Wet n Wild Fergie polishes, but Going Platinum and Gold album are definite winners. At 2:30 we have China Glaze – Thistle Do Nicely. This is from the 2014 spring collection, so it’ll be tough to find in stores. This is not a shockingly unique polish or anything. It’s just a really pretty neon coral. And while it’s not an eye-searing neon, it does do that cool thing where it looks like it’s glowing when the light is a little dim, like at dusk. With the brutal February we had in PA (and pretty much every other state east of the Rockies) I was itching for something that felt like springtime. 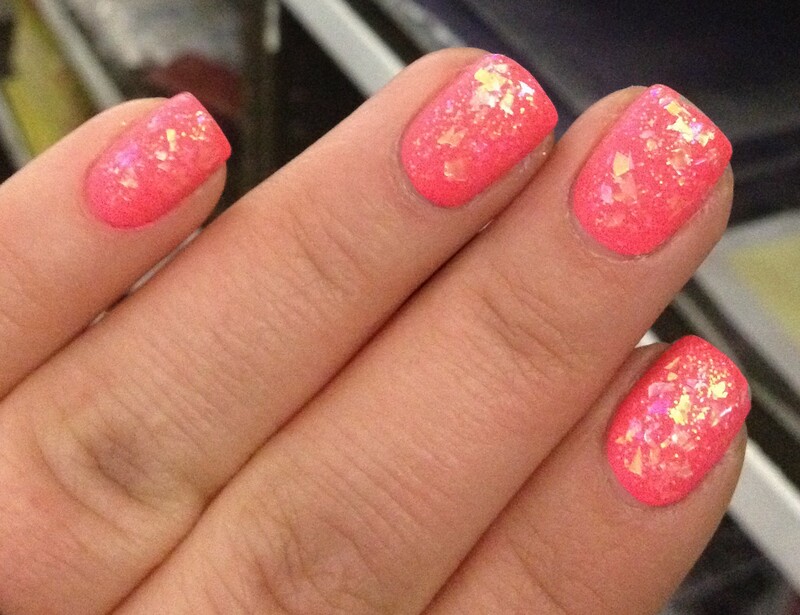 This is a polish that just makes you feel happy inside when you wear it. In this picture, I topped it with an shredded iridescent glitter which looks flaky-like. I added a matte top coat for extra fun. At 5:00, is Fresh Paint – Honeydew. 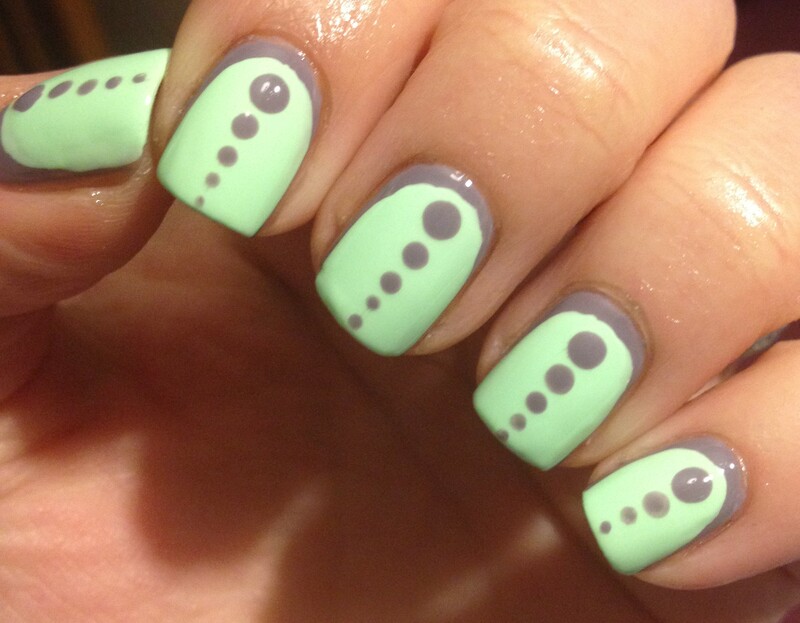 This polish is a lovely light minty, springtime-y cream polish. The formula is a tad on the thick side, but it’s almost a one-coater. One of the reasons that I’m really loving this polish right now is because it works well for water marbling. Someone on instagram (I can’t remember who, so I’m a little sad that I can’t give that instagramer proper credit) said that she had good success water marbling with Fresh Paint cream polishes, including Honeydew. Well, that gave me the inspiration I needed to take another stab at water marbling… She was right! I tested several fresh paint polishes and they all spread beautifully in the water and were easy to manipulate. I’m so happy about that! I hate using expensive polishes for water marbling, because I feel like so much is wasted. Fresh Paint polishes are always 3 for $5 at Five Below, so… that’s awesome. At 7:30 we have LA Colors – Candy Sprinkles. 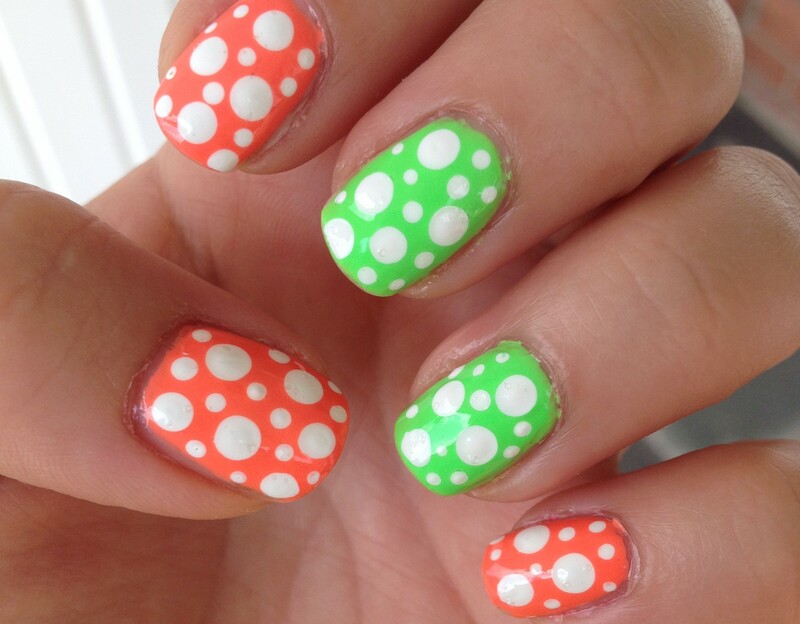 This is such a fun polish! It’s a rarity for a cheapo line of polish to have a crelly polish with awesome glitter like this. I had been eyeballing this one for a little while before I finally picked it up. This polish is sort of versatile, too. You can do 2 or 3 coats of the polish on its own if you want a really dense glitter look, or you can just do one coat over pink or purple polish if you like your polish a little more sparse. 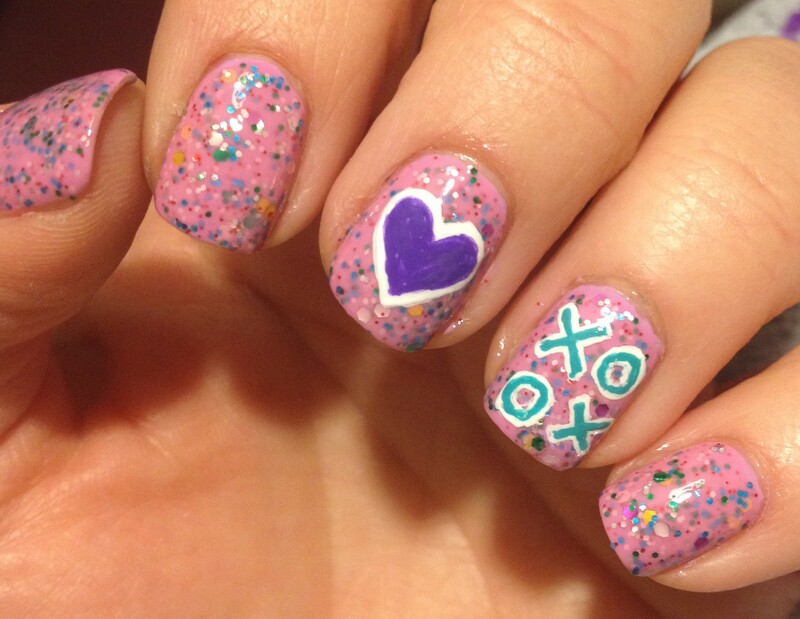 Very fun, and totally worth the $1.5Pictured is two coats of Candy Sprinkles over one coat of a pinky-lavender polish. At 10:00, we have this beauty. Such a classic. 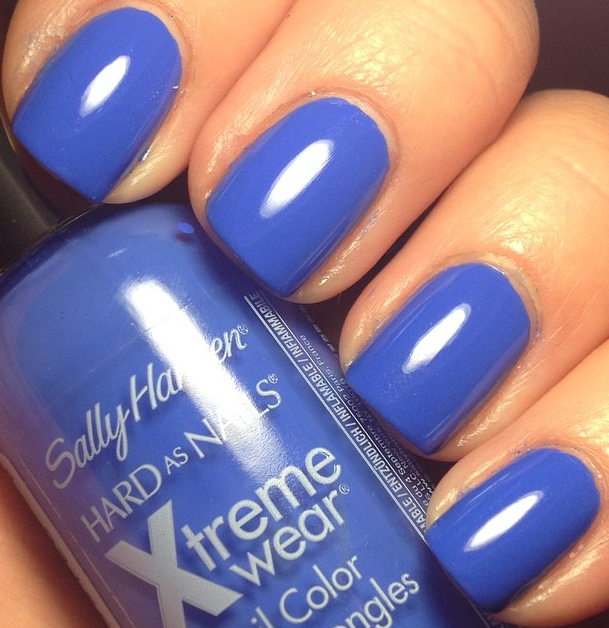 Sally Hansen – Pacific Blue original formula. And this picture is one coat. I know, it’s amazing. The nail polish world mourned when Sally Hansen reformulated this polish last summer, but I still see the occasional bottle of the original formulaon the shelf in drugstores. Really, I just saw one at the Rite Aid in Middletown, PA like, four hours ago. The new formula is a darker blue with a shimmer running through it. The original is just this perfect cream color. They both say “420 Pacific Blue” on the cap. Stupid, sneaky Sally Hansen, thinking we wouldn’t notice. So, those are my February favorites. Do you have any of these polishes? What have you been loving lately? Thanks for reading, following, and liking both here and on instagram. You people are the greatest! This entry was posted in Favorites, Uncategorized and tagged China Glaze, fresh paint, nail polish, pacific blue, Sally Hansen, wet n wild. Bookmark the permalink.